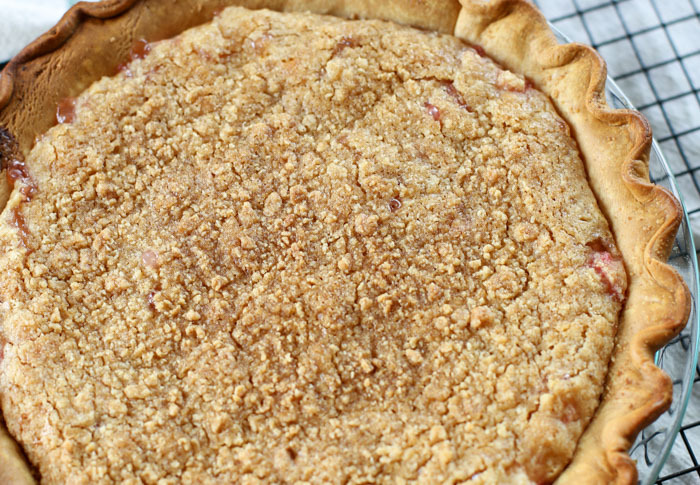 The tartness of rhubarb with a sweet pie filling and topped with a brown sugar crumb crust. The perfect combination of tartness and sweetness in a rhubarb pie! 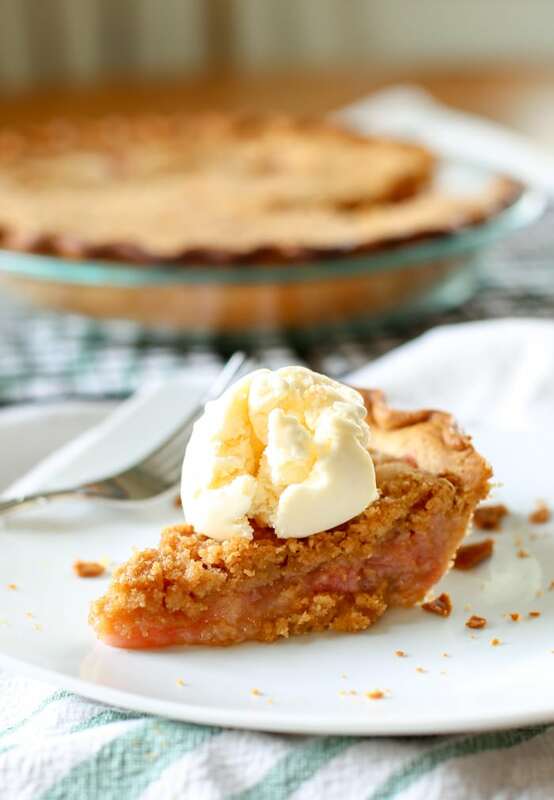 If you have friends who grow rhubarb, then you know it’s a good time to make a rhubarb pie. This time of year, people are giving it away! Rhubarb isn’t something I’ve always been a fan of, but once you find a good recipe like this, you understand the love of this vegetable. 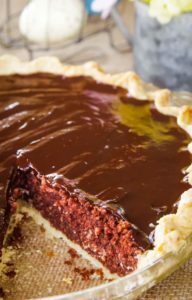 It’s not something I would bite into like a stalk of celery, but in my opinion it has the perfect tartness to go into a baked good … like this pie! 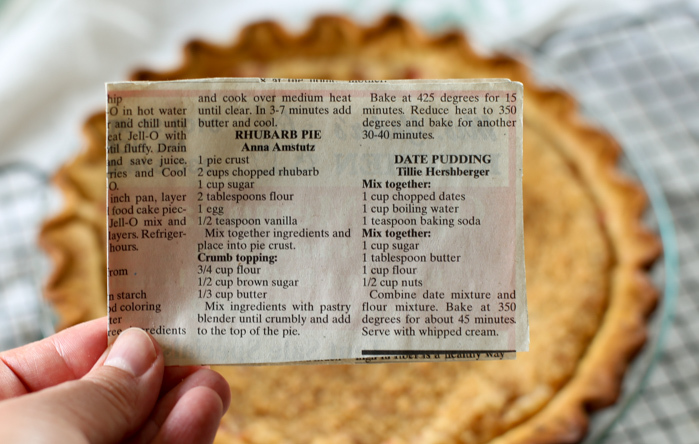 This recipe I found in my grandma’s recipe box as a newspaper article. I like these kinds of recipes because not only did my grandma find it was a good enough recipe to not only cut out, but to keep. But anyone knows that if you’re going to submit your recipe to the newspaper and put your name on it, it’s going to be your best. 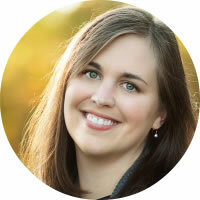 Thank you Anna Amstutz, whoever you are. Since rhubarb is not super common, here’s a few answers to the questions you might have about this tart celery-like vegetable you’re about to make a pie with. Where do you find Rhubarb? The first step to a rhubarb pie is to find good rhubarb. Well, if your neighbors have this perennial vegetable, you’ll know about it. You can also find it at certain grocery stores. I found that not all sell it, but in season some do. I found mine at an Amish bakery who also sells in season produce. Do You Have To Peel Rhubarb? No. The baking temperature breaks down the rhubarb so that no peeling is required. And thank goodness for that! It’s tart. It’s perfectly paired with a lot of sugar or with a sweeter fruit like strawberries. 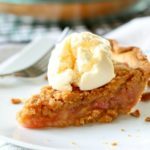 For this rhubarb pie, the crumbly crust paired with the sweetness of the pie filling, balance the tartness quite perfectly. Now, let’s make some pie! 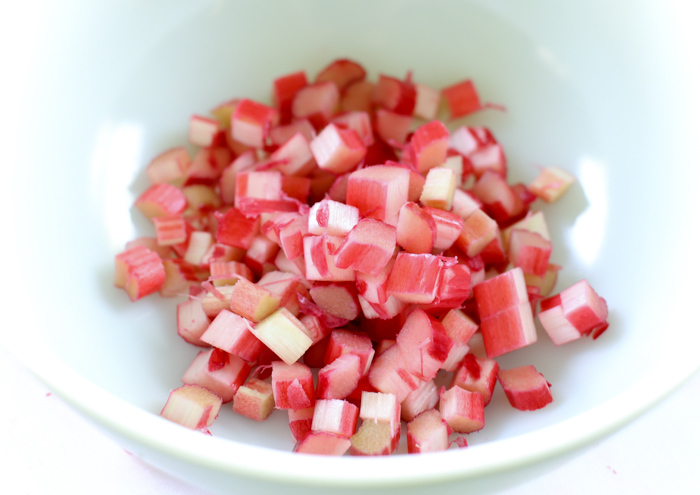 The first step to this recipe is to cut your rhubarb lengthwise and then again into small pieces. 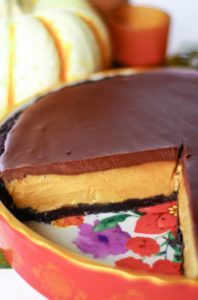 The filling in this pie, is super easy! 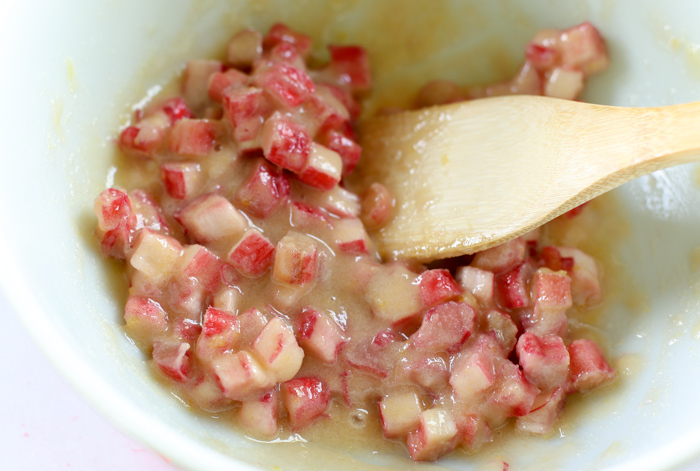 Combine the chopped rhubarb, sugar, flour, egg and vanilla and mix until well incorporated. 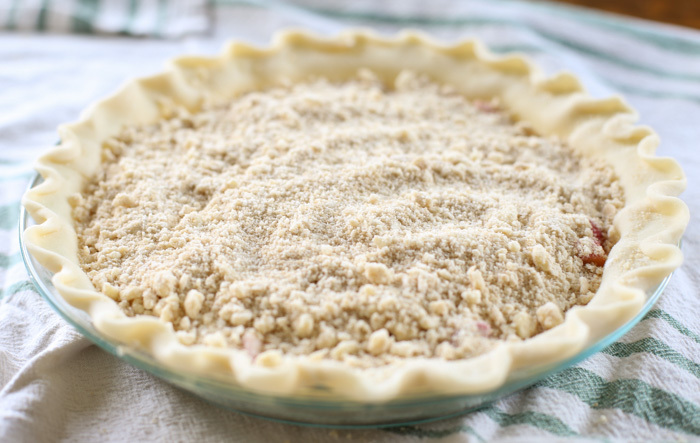 The pie crust can be homemade, like my go-to pie crust recipe here. However, you can also buy a pie crust at the store and go from there. Before I add the filling to the pie crust, I do like to sprinkle a little bit of flour on the bottom. My great-grandma always did, and therefore so do I. It works, so I don’t question it. 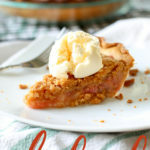 Equally as easy, is the crumble topping of this rhubarb pie. Combine flour, brown sugar and butter. Cut in the flour using a pastry blender until it’s crumbly. Easy! Just add your crumbles to the top of the pie filling. Bake at 425° F for 15 minutes. Reduce the heat to 350° F for another 30 minutes or until you see the rhubarb starting to bubble. And that’s it! 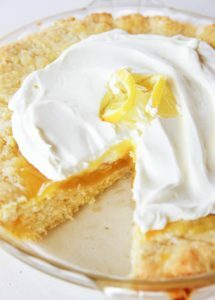 This pie is super easy to make, and makes you feel like a super star using a fresh in-season ingredient. Enjoy with a big scoop of vanilla ice cream! 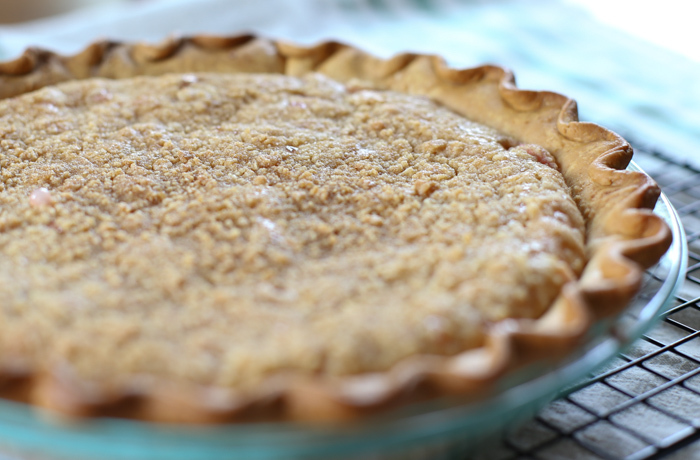 A sweet crumble topping on a tart rhubarb pie filling, make this the perfect summer pie! Mix together the pie filling ingredients and place into crust. 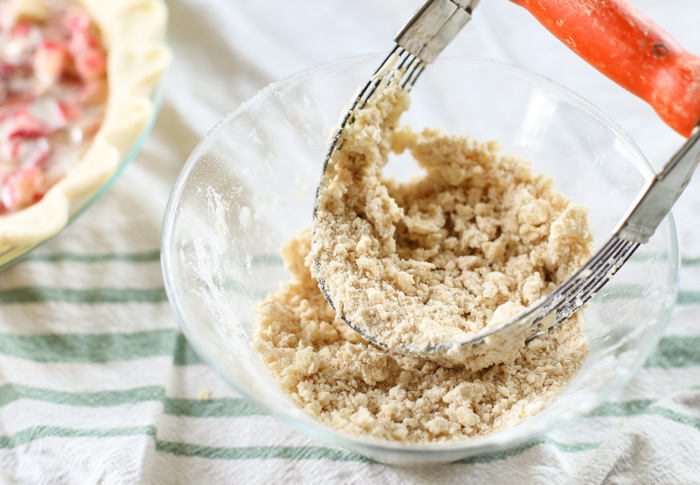 In a bowl, combine the crumb topping ingredients with pastry blender until crumbly. Add to the top of the pie. Bake at 425° F for 15 minutes. 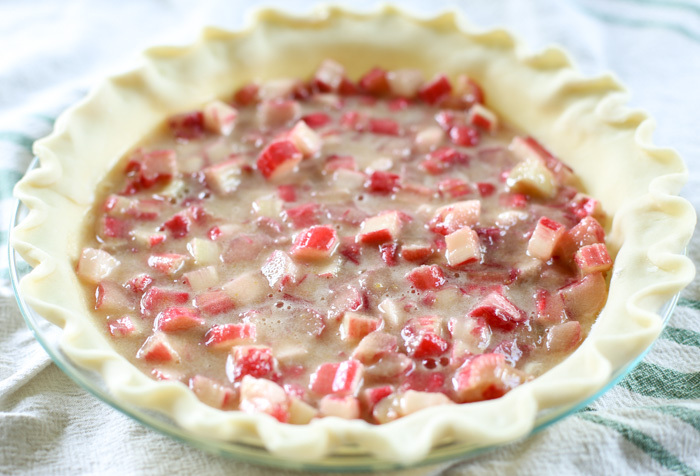 Reduce heat to 350° F and bake for another 30 minutes or until the rhubarb filling is bubbling. Let the pie cool a bit before serving. It can be served warm, or made ahead and served cool. Either way, top with big scoop of vanilla ice cream! The nutrition information does not include the pie crust. 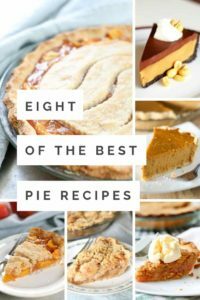 The Best Pie Recipes Ever!